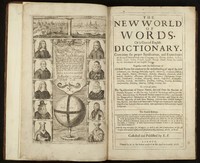 English language --Dictionaries --Early works to 1800. English language --Etymology --Early works to 1800. English language --Foreign elements --Early works to 1800. Full title: The nevv vvorld of vvords. Or a general English dictionary. Containing the proper significations, and etymologies of all words derived from other languages, viz. Hebrew, Arabick, Syriack, Greek, Latin, Italian, French, Spanish, Brittish, Dutch, Saxon, &c. useful for the adornment of our English tongue. Together with the definitions of all those terms that conduce to the understanding of any of the arts or sciences, ... To which are added, the significations of proper names, ... as also the very sum of all mythology and ancient history, ... and likewise the geographical discriptions of the chief countries and cities in the world; ... The fourth edition. Containing besides an addition of several thousand words ... a brief view of the most eminent persons of the ancients, ... With an appendix of several words thought fit to be added &c. As also a collection of such affected or barbarous words as are advis’d to be cautiously or not at all us’d. ... A work very necessary for strangers, as well as our own countrymen; o ... Collected and published by E.P. London: printed by W.R. for Robert Harford at the Angel in Cornhill. 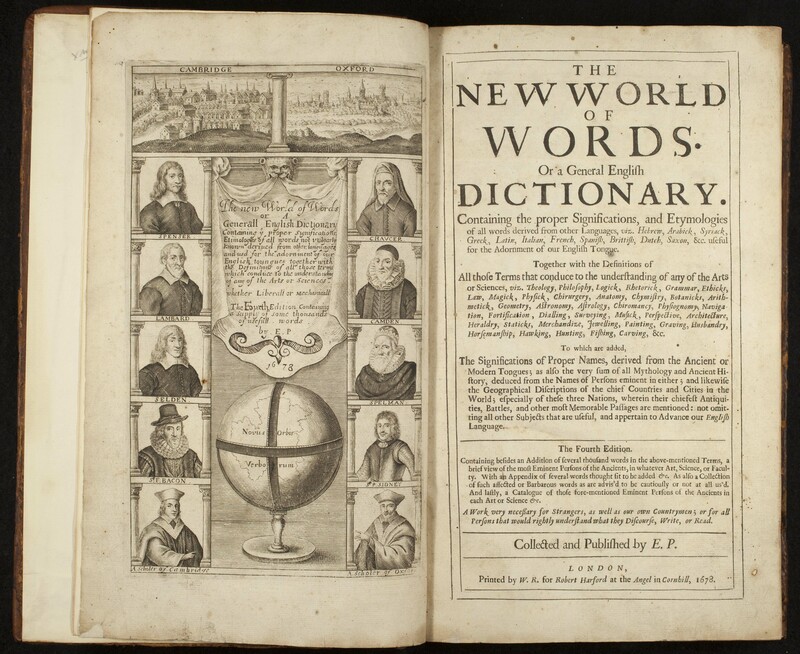 Phillips, Edward, 1630-1696?, “The Nevv VVorld of VVords. Or a General English Dictionary,” KU Libraries Exhibits, accessed April 22, 2019, https://exhibits.lib.ku.edu/items/show/7237.